Many configurations available to fit your exact needs. Electric controls take less room in your cab -- great for smaller trucks. Tough cast-iron sectional design for reliability and versatility. Handles demanding jobs with a maximum rating of 4300 PSI (when the main relief is set to a higher pressure). Adjustable main relief lets you tackle jobs of varying demands. 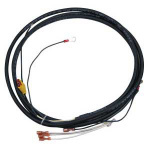 Additional job-specific workload protection with optional port reliefs (angle and dump) available. 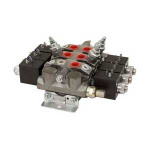 The compact Electric Sectional Valve from Buyers Products features a compact design. Its electrical controls allow you to mount a switch in the cab and control the valve remotely. 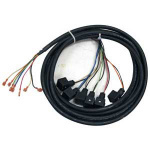 It's great for smaller trucks and plow trucks. 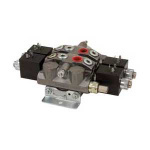 The 12V valve is rated to a max flow of 11 GPM. It features a simple on/off (non-proportional) flow. It can handle a maximum rating of 4300 PSI when the main relief is set at a higher pressure. The main relief is adjustable from 1300 to 3000 PSI (factory preset at 2150 PSI ). Two additional adjustable port reliefs -- angle and dump -- are available to provide protection for the specific job. 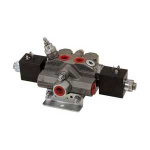 The valve has cylinder spools, and features load hold check in the neutral position, precision-machined and ground spools, and easily replaceable spool end seals.